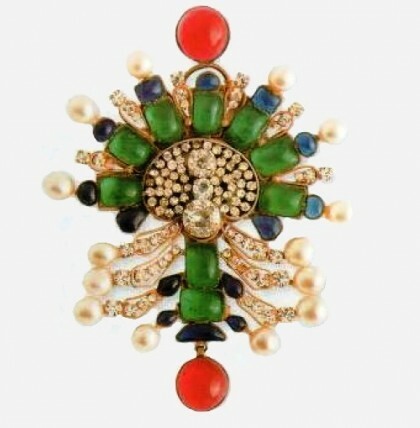 According to Chanel, the role of jewelry was to decorate an ensemble rather than to flaunt wealth. For that reason she challenged convention by wearing heaps of jewelry, and often precious. Besides, during the day – even for sailing, while for evening she sometimes wore no jewelry at all. But wealthy clients who did not wish to display their costly jewellery in public could wear Chanel creations to impress others. “It’s disgusting to walk around with millions around the neck because one happens to be rich. 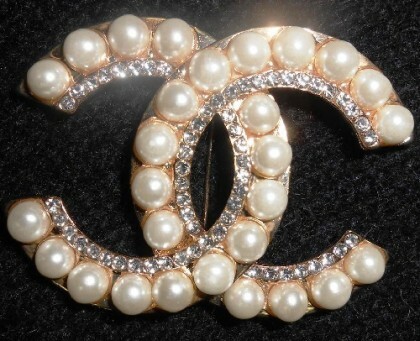 I only like fake jewellery … because it’s provocative”, Chanel stated. 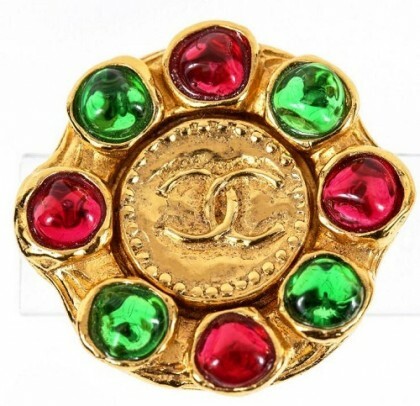 Lacking any desire to replicate precious jewels, Chanel’s designs, initially made by Maison Gripoix, defied nature in their bold use of color and size. In 1924 she opened her own jewelry workshop, which was managed by Etienne de Beaumont. Beaumont designed the long chains with colored stones and cross-shaped pendants that became a classic of her house. 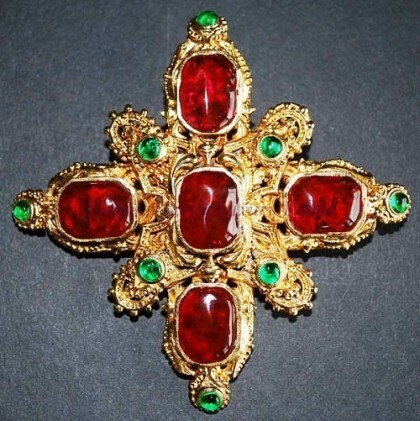 Chanel was fond of Byzantine crosses, and she was also inspired by the buttons, chains, and tassels of military costumes. 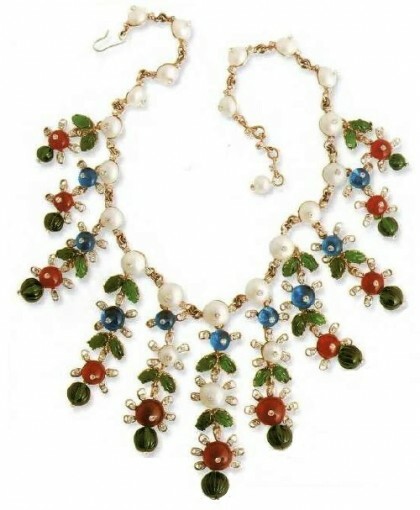 By the 1930s, costume jewelry embraced bold designs and different influences of styles and cultures, becoming highly fashionable due in part to the influence of style icons such as Coco Chanel. In 1932 the International Guild of Diamond Merchants commissioned Chanel to design a collection of diamonds set in platinum called Bijoux de Diamante. 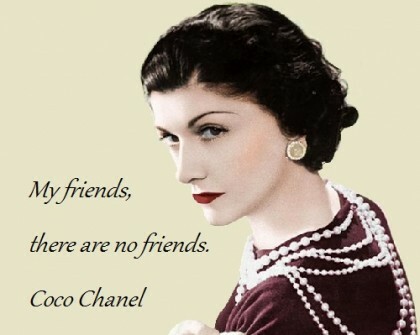 Having designed fake jewels during affluent times, Chanel now declared that diamonds were an investment. Along with her current lover, Paul Iribe, she presented a line of jewelry based on the themes of knots, stars, and feathers. The collection was exhibited in her own home in the rue du Faubourg-Saint-Honoré in Paris. 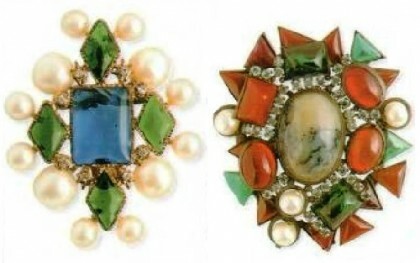 During the 1930s, Fulco di Santostefano della Cerda, duc di Verdura, started to design jewelry for Chanel. He had been designing textiles for her since 1927. 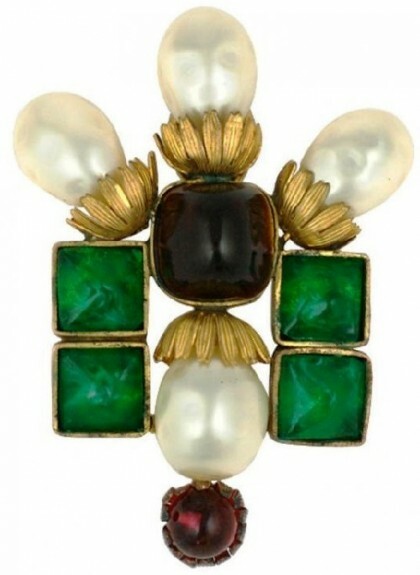 Most significantly, di Verdura pioneered the revival of baked enamel jewelry: his chunky, baked enamel bracelets inset with jeweled Maltese crosses were particularly successful. 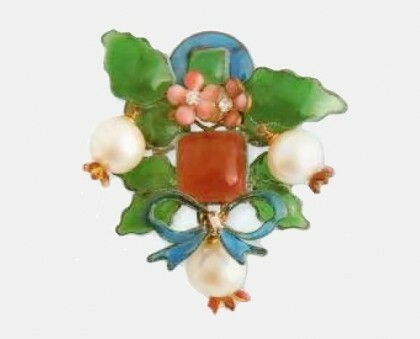 Christian Bérard also designed occasional pieces for her, and Maison Gripoix continued to make up many of her designs – notably those in romantic floral and rococo-revival styles. 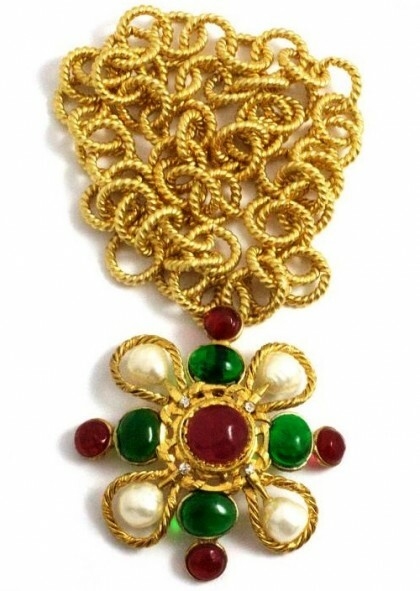 From the mid- to late 1930s Chanel’s heavy triangular bibs of colored stones and coins and her silk cord necklaces with tassels of brilliantly colored stones showed influences from India and Southeast Asia. 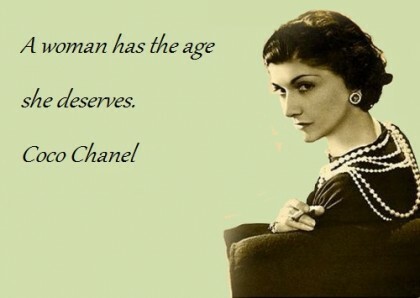 1883 Gabrielle Chanel Vonner was born in Saumur, France. 1909 Chanel begins as a hat designer and opens a shop in Paris. 1914-16 Opens a fashion house in Paris, and in Biarritz. 1923 Represents the perfume Chanel number 5. 1931 She worked with film director Samuel Goldwyn in Hollywood, creating costumes for stars such as Katharine Hepburn, Grace Kelly and Elizabeth Taylor. 1939 Chanel loses fashion house at the beginning of World War II. 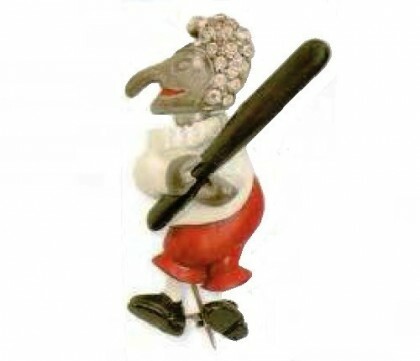 1945 She was sent to Switzerland for relations with the Nazi officer. 1954 Newly opened fashion house features a collection. 1960 Robert Goossens became a leading designer of Chanel. 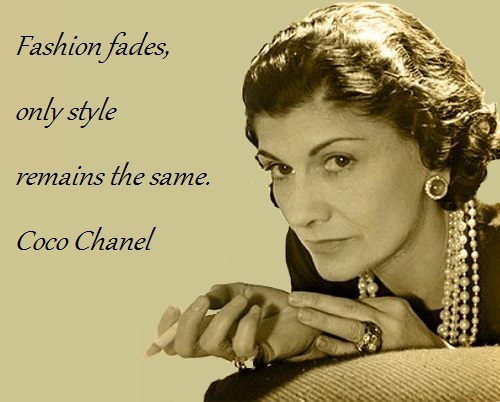 1971 Chanel died in Paris at age 88. 1983 Karl Lagerfeld became the director of the house “Chanel”. Elegant simplicity of Chanel designs was approved by Christian Dior. The design of her models was filled with common sense. Chanel invented the little black dress, sportswear, cardigan, beach suits, jewelry and famous perfume. The success was so great that on the majority of products of French exports stood her name, though many of them were good copy. French designer created a comfortable-fitting shape of the clothing of fabrics, such as wool jersey. The loose, straight-cut shapes of Chanel’s fashions and her use of many plain fabrics provided the perfect foil for the lavish costume jewelry that she introduced in the early 1920s. 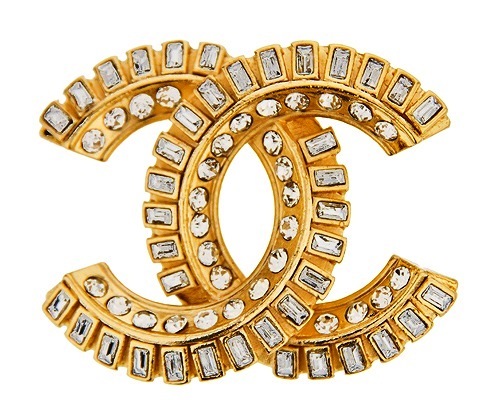 Chanel Style gained great popularity in the 1920-30’s. Her first shop she opened in Paris in 1914 with the financial support of her lover Captain Arthur Edward ‘Boy’ Capel. Chanel literally burst into the world of high fashion and big business, becoming one of the leading Parisian fashion designers. 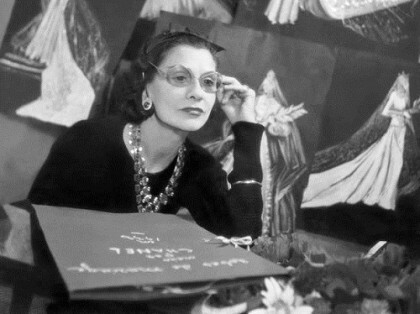 Chanel was one of the first who opened in her Parisian store boutique of accessories and jewelry, the design of which simply repeated the silhouettes, lines and colors of the clothes, giving each model that unique style of Chanel. 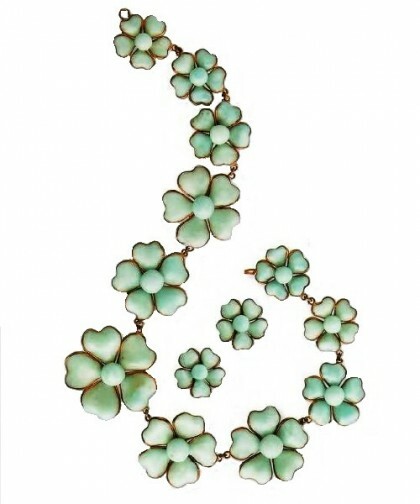 Coco introduced a line of jewellery that was a conceptual innovation, as her design and materials incorporated both simulated and fine gem stones. 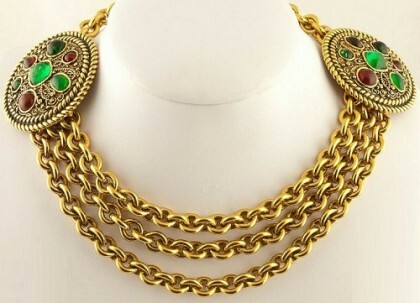 This was revolutionary in an era when jewellery was strictly categorized into either fine or costume jewellery. 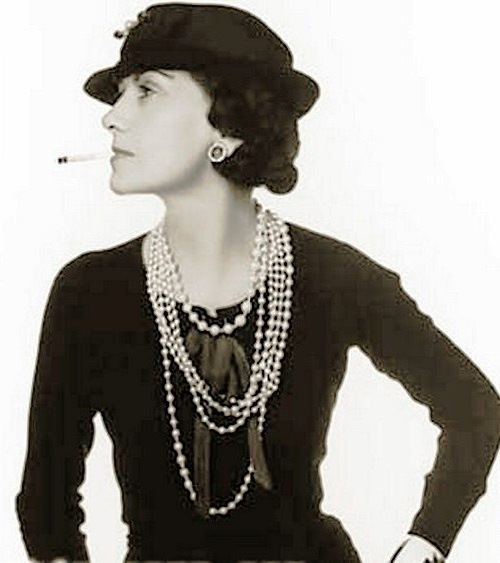 Chanel wore pearl necklaces longer than one meter, which was an ideal for Parisian elegance. 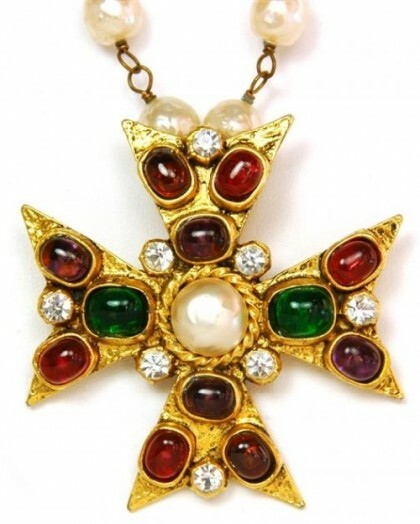 Pearls have become a symbol to many, as well as her historical costume jewelry such as crosses and earrings in the Byzantine style and the style of the Renaissance. Her inspirations were global, often inspired by design traditions of the Orient and Egypt. Sensual by nature, Coco Chanel found inspiration everywhere: medieval stained-glass windows, Russian icons, Byzantine mosaics, works of antique sculpture, the ancient Egyptian hieroglyphs, and much more. 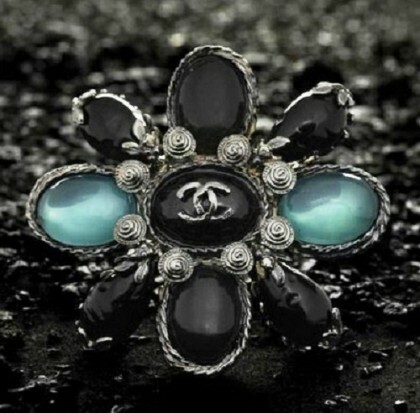 Chanel Jewellery was sold and is still sold in special boxes, on which is the name of the manufacturer. Each item in the set is always sealed. 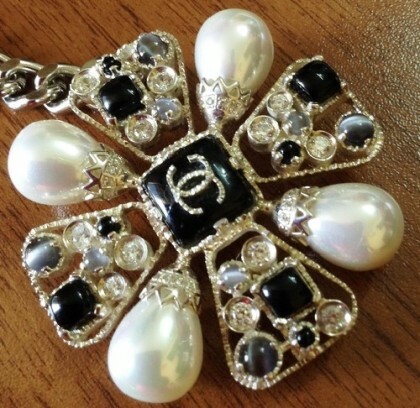 Chanel’s early works in the antiques market are always sold without the original packaging. 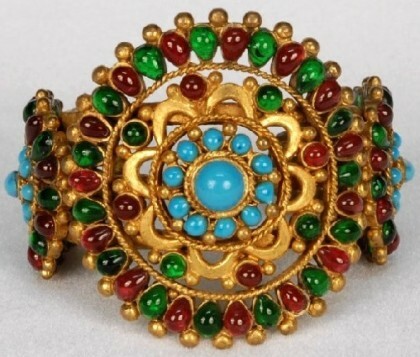 Jewellery made of artificial stone and artificial gold was comparable only to that of products made of pure gold and precious stones. 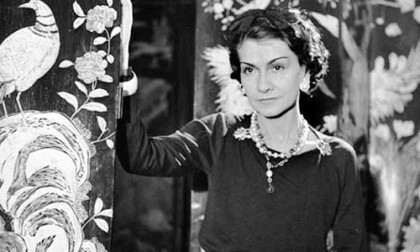 The company went on to produce a collection of Chanel after her death. 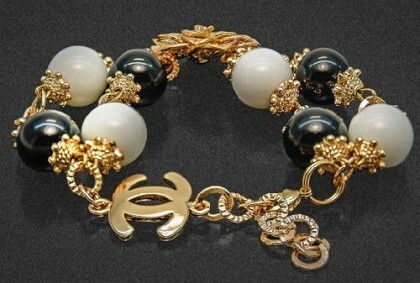 In 1983, Karl Lagerfeld, becoming director of the company, added to the collection of Chanel products of the new design. 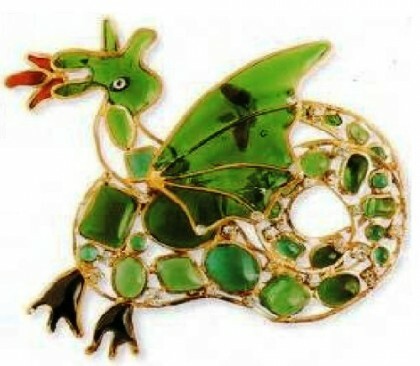 In the late 1920s and early 1930s, Chanel produced a series of enameled brooches of lead, decorated with rock crystal. Most of them – figures of cats and frogs. It is believed that they were made in France, although many of them were made in America. 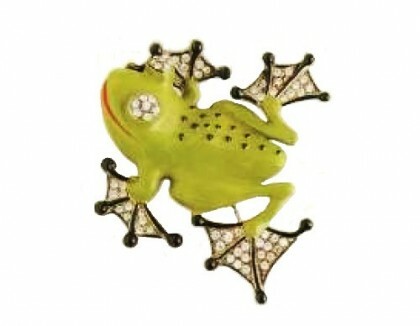 Enamel and rhinestone undoubtedly of the highest quality. 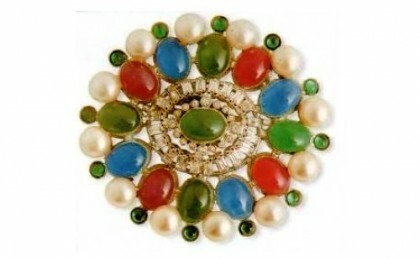 Brooches are very rare and change the owners for a very significant amount. 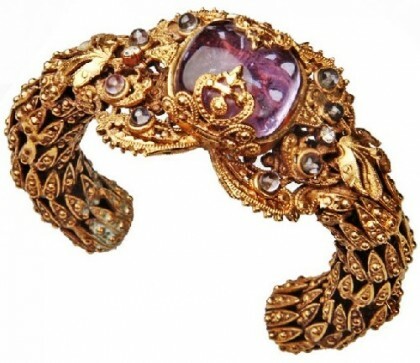 Speaking of vintage Chanel jewelry I first remember her beautiful “Byzantine” bracelets and brooches created in 1930-1940-ies. 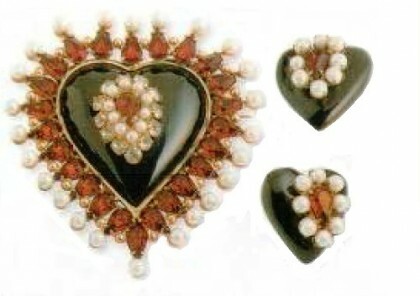 Regally large decoration of “Russian gold” color, enamels and medieval glowing cabochons, crystals, and pearls. To be stylistically accurate, these decorations were amazingly eclectic, combining elements of historical styles of different eras, from antiquity to the late Middle Ages. 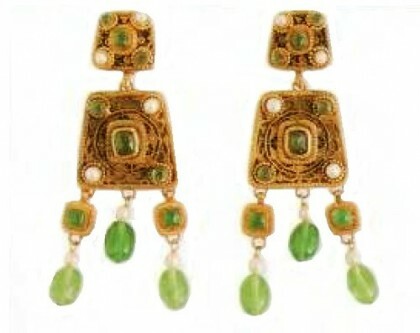 But, as a source of inspiration for Chanel were just Byzantine mosaics, seen it Ravenna and Venice, all “historical” Chanel jewelry called “Byzantine”. Such a tradition. 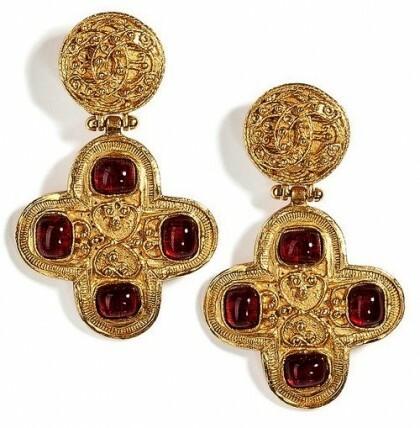 The source of inspiration for designers of jewelry and Chanel were authentic medieval artifacts. For example, the crown of Emperor Otto III, preserved from the X century AD. 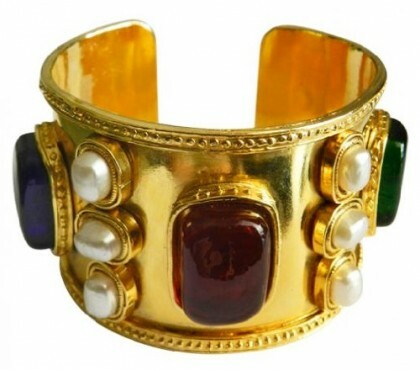 On the motives of medieval crowns were created several bracelets in a wide gold rim with rows of pearls and large art glass cabochons. 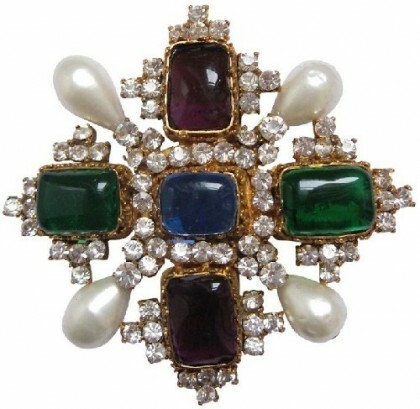 The most impressive Coco Chanel jewellery in “Byzantine” style was made from the late 1930s until the 1960s. Today this style of jewelry has a high value and decorates not only private collections but also collections of major museums in the world.